As noted in a post below, I have been diagnosed with PTS and have suffered a number of pain issues for decades. The two are most likely related (the topic for another post), but recently led to my exploring, and trying, CBD oil to see if it might help. When you have five or so people from different parts of your life suggest it within the span of a few days, I took that as a sign that I needed to investigate it. Before trying it, however, I did some due diligence and researched what CBD oil is, how it works, and what lay under all the popular articles. It’s not that I don’t trust popular articles or even most medical journalism; but, that I know how the process works from the journalistic side. Even in the best researched articles, there usually are word limits (a left-over from print days), focus issues (articles can be very tightly focused), and advocacy issues (advocacy journalism being something I recognize and loath). The latter can and do leave out a lot of information that is needed in order to make an informed decision. The problem with researching CBD oil lies in its ties to medical marijuana. One aspect of the problem is that there is a lot of “information” out there that is clearly advocating for medical marijuana and legalization. The second is a tendency to focus just on THC (delta-9-tetrahydrocannabinol). The problem with the latter is that THC is just one component that makes up a range of cannaboids. The fact is, the body produces a number of cannaboid compounds on its own, and they are essential components the neurological system of the body through two major receptors: CB1 and CB2. There is a possibility of yet more receptors, though none have (yet) been isolated. These compounds produced by the body, known as endocannaboids, are part of what is now known to be the endocannabinoid system (EC system). An article that discusses the basics on a general level can be found here. A much shorter blurb can be found here. A far more detailed account, with references, can be found here. For those interested, the cannaboids created by the body are lipids (fatty) and appear to be produced “on demand” by the body rather than stored. There are a number of issues that can prevent proper creation, including the lack of certain fats (Omega-3 being frequently mentioned) in the diet. There are other issues that can effect production. While many (most?) of these are in the brain, they are also located throughout the body and various organs. Not only are they required for normal function, they also appear to play a (crucial?) role in mitigating out-of-control reactions (pain, autoimmune, etc.). Indeed, there are studies showing that CBD oil can help with epilepsy and seizures (in fact, the FDA has approved a CBD treatment for severe forms of epilepsy); that it may have antipsychotic effects; that it may be effective against certain types of cancer; that it may be effective in treating a variety of anxiety disorders; that it is effective against Type-1 diabetes; that it is effective against inflammation, acute and chronic pain, and inflammatory and neuropathic pain; that it is effective in helping people quit smoking cigarettes; and that it may be effective in treating opioid and other addictions. There are, of course, a host of other claims, most of which are awaiting formal study(ies). On all, do your homework. Now, for the bad news. Since production is not regulated and there is no industry-wide agreement on labelling and other factors, not all CBD oils are the same. In fact, right now, it is a bit of the Wild West in terms of how it is produced, from which parts of the plant it is produced, the levels of various compounds in each brand, and in terms of purity. It is very much buyer beware! That said, I found a couple that I was willing to try, and I chose one for my first effort. 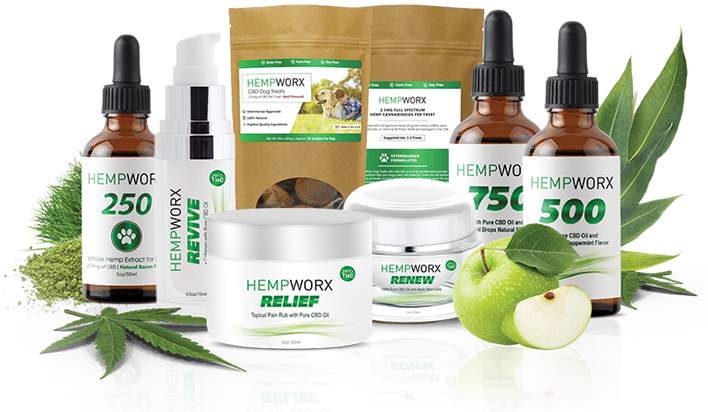 It was around that time that a good friend of mine let me know that he was a distributor for a brand(HempWorx), and I checked it out. I tried it, and will recommend it to you. In fact, in the interest of fairness and transparency, I’m looking at becoming a distributor. While it is anecdotal, my own experiences are that it: reduced overall pain and inflammation, to the point I was able to start reducing my arthritis medicine; it did have an effect on some of the secondary effects of the PTS; and, it helped in some other ways as well. While some effects became clear within a few days of starting it, it was not until the second or third week that the larger effects became apparent. For a number of reasons, I’m using the no-THC version. The max allowed by those states that do allow CBD oil to be purchased and used tends to be .3%, which will not make you high. This does not mean, however, that you will not trip hot on a drug test. Many tests simply look for cannaboids rather than THC. So, if you serve or are otherwise subject to drug testing, check with your employer before use. For that matter, you should check with your physician or other doctors before use. Again, it’s part of your due diligence. As is checking the laws of your state, or any other state or country to which you may travel. The laws vary, are in flux, and you need to be sure of what you do. Also, a thought to share is that you need to look at your diet. Make sure you are getting enough of the right types of fat in forms your body can use. If anyone else has any good studies to share (studies, not articles about same), please share. Not so much an apology, but an explanation of my lack of blogging the last few years. For anyone interested. As a good friend told me a couple of years ago, if you want to look after others, you have to look after yourself first. That can be hard for me, as I tend to put others first. Fact is, I was born allergic to almost everything, and that made my childhood interesting all by itself. About three years ago, I was told I had cancer, based on a purely visual exam. Took an exploratory procedure to prove I didn’t, and, yes, I fired the first doc in question and will never go back to a second. Thankfully, found a very good doc in the process that I will cheerfully use again at need. This was why I stepped down from Mission: VALOR and turned it over to others to run. Then, other issues required me to be tested for a variety of nasty auto-immune diseases. Again, thankfully, those were negative though I do have arthritis and some other inflammation issues. I feel weather changes more than I realize, as I have a tendency to ignore (and not recognize) pain and related. I’ve lived with some degree of pain for so long it simply doesn’t register as such. Some of the issues come from things I’ve done in the past, and as I’ve told some, if I had known how much I would pay for them later, I would have done more so I feel that I have truly earned it. That said, glad I did them despite the price. Almost exactly a year ago today, I had what was supposed to be a routine colonoscopy. Unfortunately, there was bleeding after that sent me to the ER and required an emergency procedure to deal with, during which I had to be given Epi to keep my heart beating. I was conscious and watching when I started to crash again in recovery. Remember not being scared, and found it interesting that the 12-lead data did not show what I would have expected for what happened. Thankfully, my heart did not stop and I did recover. Sadly, I never have gotten honest answers about comments I overheard in the ER about the original doctor and what was/was not done, and as such will never use the IU network again. On top of it all, some other things led me to get some help and a diagnosis of non-combat PTS. The root issue has been addressed, and I will add that my time in Iraq was beneficial for my PTS, which says a lot. I will say that EMDR works, is intense, and I don’t recommend pushing it and treatment as hard as I pushed mine. Now dealing with the secondary effects (all the things other than the original cause) and moving forward. I would remind everyone that Hollyweird and the media do not give an honest or accurate account of PTS, and that the majority of those who have it are not a danger to others (mostly to themselves). I’m now part of an amazing survivors group. If you have PTS, depression, etc., please do reach out. Too many don’t, and feel cut off and alone. You are not. Please, take the time and reach out to someone. It is hard, but worth it and there is no shame in getting help. So, putting myself and my life back together, and it is an interesting journey. Sometimes in terms of the Chinese curse, most of the time a good and blessed thing. My faith has been strengthened, as I see many blessings and examples of when and how things could have been much worse. My faith in humans and human institutions, well, still not high and as a convert to the Catholic faith not improving given leadership of same, from Pope Che (as a friend calls him) on down. There are a number of good priests, however, and they do so much for so many. All any of us can do is try to do our best, to help others in need, and to try to do some good in the world. The latter takes many forms, and I am more committed than ever to our troops and veterans for they do a lot of good at a high cost to themselves. There is more to come, though it may be a bit sporadic for a while.